After starting your business in Japan, it is likely you will run into a call with a Japanese customer or client. Thus, it is important to understand Japanese phone etiquette. Even if the person you are talking to speaks English on the phone, it is important to know and use the proper etiquette when speaking to them. Although speaking in Japanese can be daunting and overwhelming, learning the rules and some basic phases can ease this tension. Remember that by giving someone a call you are technically hoping that the person on the other end will spare some of their time and attention for you. Usually, that is not a problem if you are calling to a family member, a close friend or a customer support. Companies are willing to deliver good customer services and are expecting incoming calls. However, when you act as a service provider or a business partner to a Japanese company, you do not have that privilege anymore. In the cultural realities of Japan asking for such kind of personal attention from an unknown person, a business partner or especially from your customer without a prior agreement is a bothersome intrusion to their private space and life known as meiwaku. This is probably one of the top things to avoid in your business operations in Japan. This word is often translated as “spam” even though it can be used in relation to any situation or even a person in life. There is a meiwaku mail, meiwaku ads, and meiwaku calls. All of these will be blacklisted, filtered and blocked straight away. Thus, make sure you are not being a meiwaku to a person you are about to call. In order not to become a bothersome caller respect your partner’s personal space and schedule. Make sure you check the following things before making a call. Business culture in Japan is quite rigid and all the interactions are rather formal. Thus, make sure to call during courteous times – business hours are the best. However, if your matter is not urgent, try to call between 5 and 7 p.m.
Avoid calling your partners or customers early in the morning, during lunch, knowing that this person is about to leave after a working day, and around commuting hours. Taking on the phone in public transport if frowned upon in Japan. Your partner might end up in a difficult situation of not answering our phone or having to speak in a transport. Thus, it is good to agree on calling time or schedule a call in advance if you have such an opportunity. Japan is not different in terms of relationship building: in the majority of cases, the more time you spend interacting with somebody, the closer you become. However, the timeframe for getting to know each other better may be longer in Japan. In the beginning, things can move slower than you have expected. It takes time to build trustworthy relationships and in the early stages of communication you may still be at the bottom of the priority list of a certain company. Most probably you will not get to talk to the head of a corporation or even a department during your introductory call; your call may be redirected to a representative or scheduled further in time compared to your initial plan. Japan values well-established and long-term cooperation with trusted people built step-by-step over making a one-time deal. Thus, try not to push too hard or rush things as it can be considered an aggressive behavior. Think about how long have you been communicating with this person or company and try to evaluate situation form your partners’ point of view. Then choose the communication style accordingly. Your relationship with the partner directly influences the style of communication. Japanese language has several levels of polite speech and several sets of vocabularies that are used depending on the social situation and the status of the people involved. Speaking on the phone requires special skills and is being taught even to Japanese people, too. To be on a safe side, you can always try and mirror the style of your Japanese partner. If you are speaking English, try to use polite expressions even if they seem too stiff, formal, or cold. Being too casual might be seen as vulgarity and ill manners instead of friendliness. When you have picked the right time, evaluated the status of your relationship with the partner company and a style of speech you are using, it is time to make a call (or receive one). As simple as it may seem, there are several small details that you need to pay attention to in order to make a pleasant impression on your Japanese colleagues. Be quick. Try not to make people wait. Pick up the phone as fast as you can, preferably within 2-3 rings. It is a common courtesy to always apologize for making a caller wait for a response. Be simple. It is much harder to communicate when speakers do not see one another as there is no additional information coming from a person’s facial expression or gesticulation. Thus, try to use simple words and expressions, formulate your sentences short and precise, helping the listener to understand you better. Be clear. Besides not seeing the partner, quite often one also can not hear the partner clearly. Usually, there is a lot of noise disturbances happening in the background at all times, so try to speak clearly and at a normal pace. Do not rush talk, whisper, mumble or speak too loud. Whether you are speaking Japanese or English, it is probably a challenge big enough for one of you, so it is good to avoid additional stress factors. Be focused. Dedicate your attention solely to your partner. Otherwise, it might look like you do not care about the conversation, which may be a deal breaker. Being entirely focused on the conversation is the least you can do for your colleague. Remember that the conversation you have is also between you two only, or so it should look like. That is why, if you need to pause or transfer the call, make sure to mute or block the sound of the conversation you are having on the background to sustain the atmosphere of privacy and focused conversation. It is also not polite to indirectly expose the inner operations of your company to your business partners. A very important thing to know is that in Japan the conversation is over only when one of the parties has cut the connection. Even if you have finished talking and plan to hang up in one second, that last second is still considered to be a part of an active conversation. One must stay focused until the very end. There are several reasons for this practice. Firstly, most of the people in Japan are reluctant to hang up first in business conversations. It has to do with the politeness rules since no one wants to cut the other person out. So people keep on saying and repeating set phrases to end the conversation while also carefully listening if the counterpart has hung up or not. Thus, everything said in the last second will definitely be heard. It is good if the customer or a partner leaves the conversation first. This move shows that you are willing to stay longer if necessary for their convenience and it is up to them to decide when this conversation is over. Secondly, as the continuation of the conversation rules above, people do not want to be overheard and expose the inner operations of their company to non-company members, even if it is just a couple of words. Thus, do not start chatting with somebody else until a person on the other end has switched off. Also, if you start talking to somebody else straight away without hanging the phone, the person on the other end of a line might think that you were eager to end the current conversation as soon as possible in favor of another one, which is impolite. 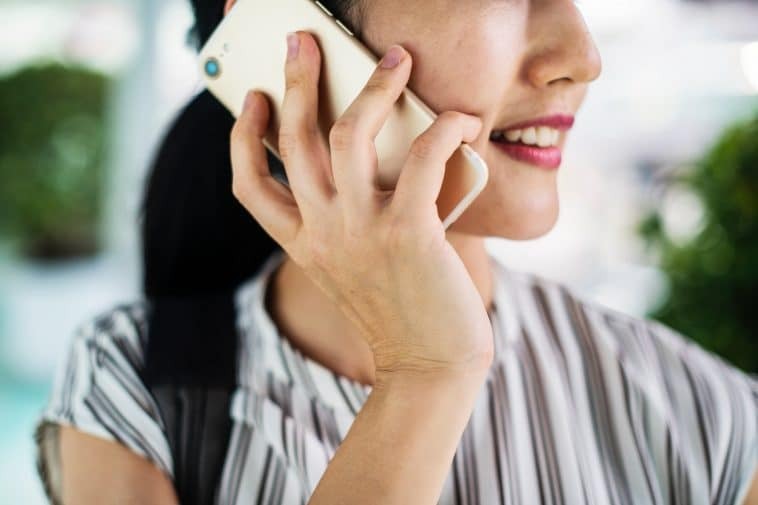 Knowing the right things to say on the phone can help prevent offending potential clients and start off on the right foot. Although many of these listed ideas are pretty obvious, it is important to realize the significance it holds in Japanese society and culture. Always keep your conversation partner in mind and take care of their comfort during your communication by staying polite, clear, simple and focused. It is always safe to be more formal than too casual. If you are not sure how to behave, observe and mirror your partner’s communication style. What is the right way to start a conversation? Many people have heard the phrase “moshi moshi”, but it should not be used in business situations. This is a friendly greeting for close people. When answering the phone it is better to say “hai” (yes) to show that the conversation started and then state your name and your company name to let the caller know whom they have reached. When you are calling someone, listen to the greeting from the receiver and state your name and your company name. If you have mistakingly called the wrong number, do not drop the call. It is polite to apologize for disturbance and only then end the conversation. Can I share other people's phone numbers? While networking is a great way to grow the number of your professional connections, passing on name-cards and contact details without their holder’s permission is a very bad idea. In Japan, it is important to introduce people properly, meaning that every person involved is aware of this operation. Maybe this will not be a face-to-face meeting, but if you want to share or ask for contact details of certain people, make sure they have given you their consent to give away or receive such data beforehand. Should I call back to unknown numbers? Ultimately that depends on whether you were expecting a call or not. If it is usual for your company to receive a lot of calls from potential clients because you have shared your contact details on the Internet, you could call back to check if that has been a customer. In other situations, however, taking into consideration the contact-sharing rules and the current state of technology, you would probably have all the important contact data saved to your phone beforehand. The final decision is up to you. There is no call-back culture as such in Japan.